Is trade embargo with Cuba hurting U.S. interests? HAVANA, Cuba (CNN) -- If Americans wonder what it's like to travel to Cuba, just ask a Canadian. 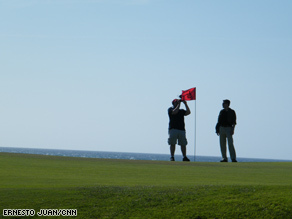 CNN recently visited one of the two golf courses in Cuba. "Let's be honest, there's a mystique about Cuba," said Graham Cook, a Canadian golf course designer. Or ask South African pro golfer Ernie Els, the star attraction at a Cuban golf tournament aimed at turning the island into the sport's next destination. "It would be great to see the Americans and the Cubans get together," Els said. "There's lots of potential here." Every year, foreign travelers escape to Cuba's exotic shores and Spanish colonial streets, pumping an estimated $2 billion into the island's economy. There are stunning examples in Cuba of how America's biggest competitors are investing heavily in the island nation, from European hotels to Chinese oil drilling operations. But the 47-year-old trade embargo with Cuba has Americans only watching from the sidelines, 90 miles away. The trade embargo was imposed on the communist island in 1962, years after Fidel Castro led a revolution to overthrow Cuba's Batista dictatorship. Although Castro was credited with bringing social reforms to Cuba, he has been criticized around the world for oppressing human rights and free speech. "We are open to the world. It is they [the U.S.] who cannot come," Trujillo said. Raúl Castro: Cuba ready 'to discuss everything' with U.S.
Once known for its classic cars, Cuba is no longer just a time machine to the past, leaving the U.S. with a choice: whether to shift a decades-old policy or let sleeping dogs lie. It seems, by most accounts, that the Cold War tensions between the two countries may be slowly relaxing. A growing number of U.S. senators want to end the U.S. travel ban on Cuba and consider scrapping the embargo. On March 31, senators and other supporters unveiled a bill to lift the travel ban. "We don't limit the right to travel to China or Vietnam ... but we decide to punish the American people by refusing them the right to travel to Cuba," said Sen. Byron Dorgan, D-North Dakota, who was one of the bill's sponsors. Not everyone in Washington, however, is eager for change. Cuban-American members of Congress, in particular, have voiced outrage over the easing of relations. Sen. Mel Martinez, R-Florida, was born in Cuba, and he doesn't want to see changes to the embargo. "Having tourists on Cuban beaches is not going to achieve democratic change in Cuba," Martinez has said. New Jersey Sen. Robert Menendez, a Democrat and Cuban-American, said in a recent speech that the Cuban government is "pure and simple a brutal dictatorship. ... The average Cuban lives on an income of less than a dollar a day." At the Summit of the Americas in Trinidad and Tobago last month, Obama said he is seeking "a new beginning" in U.S. relations with Cuba. "Let me be clear: I am not interested in talking for the sake of talking. But I do believe that we can move U.S.-Cuban relations in a new direction," he said. "I am prepared to have my administration engage with the Cuban government on a wide range of issues -- from human rights, free speech and democratic reform to drugs, migration and economic issues." And the Cuban government may be biting. "We've told the North American government, in private and in public, that we are prepared, wherever they want, to discuss everything -- human rights, freedom of the press, political prisoners -- everything, everything, everything that they want to discuss," Cuban President Raúl Castro said at a summit of leftist Latin American leaders in Venezuela. But there may be more than travel and political negotiations at stake. China is now a player in Cuba, selling the island tourist buses. And the Chinese are getting more than cigars out of Cuba; they're tapping into the country's oil reserves. Secretary of State Hillary Clinton calls China's growing influence in Latin America disturbing, and she says she feels the same about Iran. "If you look at the gains, particularly in Latin America, that Iran is making and China is making, it is quite disturbing," Clinton said Friday at the State Department. "They are building very strong economic and political connections with a lot of these leaders. I don't think that is in our interests," she said. The next phase in U.S.-Cuba relations won't be easy. As a former Canadian ambassador to Cuba told CNN, it's complicated. As both sides start talking, old controversies will rise once again.